BBS Ltd - Magimix U.K. Official spare parts Supplier - for over 25 years. BBS Ltd is the only Magimix U.K. Authorised Supplier of all Magimix parts and have been for over 25 years. We only supply genuine Magimix spares with full manufacturer`s guarantees, we keep records of any purchases, so give . We have thousands of items for immediate Despatch. As experienced main service agents, BBS Ltd prides itself on its knowledgeable service to customers, speak to our staff. Find your spare part or telephone 01252 727755. 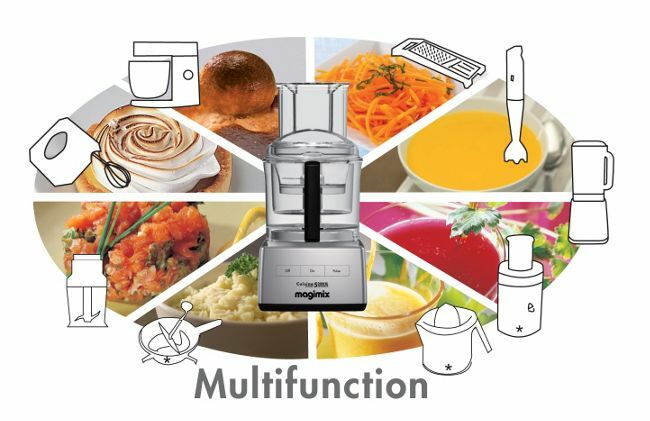 We aim to keep the full range of Magimix food processors in stock. If you buy a new Food processor from BBS ltd we offer Free Delivery, a "30 years" manufacturer`s Motor Guarantee plus 3 years warranty on parts. We will try to match prices advertised by any other company online. BBS Ltd also supplies most of the attachments, bowls, lids, accessories for older Magimix models all with long Guarantees ..... they do seem to last a long time. Juicers / Smoothie makers ideal for fresh green Juice or citrus for 5 a day. Ice cream machines for homemade gelatos, ice cream for special diets. Food blenders with mill attachment for super quick spices and soups. Food steamer plus rice cooker ideal for healthy eating steamed fish. Fryers with cool zone, for quality chips, fish, tempura, many others. Mini Choppers for baby food, quick chopping of onions, dips or Mayonnaise. BBS ltd supplies a range of high quality British made Aprons, bakeware, cookware, kitchen gadgets, tools, utensils and kitchen Equipment accessories. We have extensive knowledge of cooking and baking and have used this to choose robust and innovative kitchen accessories. BBS ltd are accredited suppliers of Robot coupe catering equipment and food processing equipment, specialist in supplying Robot coupe Parts, Robot coupe Food processor spares, and Musso ice cream makers. We supply catering equipment to many schools, local Government and councils on a proforma invoice basis. Please give us a ring or email your requirements if you need a large order, we will be happy to supply a Quotation. BBS Ltd also offer a Free Demonstration on all Robot coupe machines.